Steakhouse Elite enhances American meals with unique, flavorful beef to deliver a true lifestyle upgrade at an affordable price. Steakhouse Elite works with distributor partners nationwide to deliver specialty blended beef products for the discerning American palate. BACKGROUND: Steakhouse Elite started gaining traction with their flagship line of beef products that were a mixture of traditional American cattle and American Wagyu cattle (the same type of cow that the Japanese called Kobe). PROBLEM: Steakhouse Elite needed a way to expand their product lines, and increase their brand recognition in order to grow their business. Consumers were starting to discover the distinctive flavors of the company's beef products, so Steakhouse Elite wanted to tap into consumer desires and tastebuds. SOLUTION: Kinetic Branding created a brand strategy using their proprietary Brand Energy process, and implemented the strategy through a campaign made up of several brand communication pieces, listed below and detailed on this page. The unique Brand Energy Formula that Kinetic Branding identified for Steakhouse Elite is Belonging, Discovery and Get The Best. These are the deep-seated felt needs and authentic emotions of the Steakhouse Elite target audience. Meeting these emotional desires are the focus Kinetic Branding branding projects for Steakhouse Elite. Everyone wants to belong to a group of people with similar interests, personalities and cultures. Steakhouse Elite offers people the chance to connect with people and enjoy exceptional flavors together. Instead of focusing on only the flavor and taste of the product, Kinetic Branding focuses on the human connection that is achieved through wonderful meals with friends and family. The desire to belong is greater than just the taste of a product. Discovery is in our blood. Some to explore the world, others to search for the perfect shopping mall, and still others to uncover new and innovative products. Kinetic Branding believes that the excitement of discovery is a pivitol part of the Steakhouse Elite brand energy formula. People want to discover new flavors. Having the best quality meat is something that ties into the desire to belong and the excitement of discovery. The consumer will dig deeper to discover which product really is the best because of their care and concern to connect with people and discover new flavors. They will read reviews and do their research in order to get the best for their backyard barbecues. The new corporate brandmark that Kinetic developed for Steakhouse Elite was based on the company's newly discovered Brand Energy Emotional Elements and their unique Brand Energy Formula. The old logo (shown right, top) has an old western look and feel with a saloon-like font. When Kinetic met with the leadership of Steakhouse Elite to discuss the logo redesign, they revealed that the company stood for premium meat and modern culinary strategies. The western logo design clearly did not match the brand nor did it match the Brand Energy Analysis that Kinetic Branding developed for Steakhouse Elite. ​The new logo design (shown right, bottom) maintained some layout similarities with the old logo, but was completely modernized to match with the company's desired goals. The new design is more bold and stylish. Based on the top two Brand Energy Emotions of "Belonging" and "Discovery," Kinetic developed the campaign theme titled: Tailored To Your Tastes. The theme title itself leans towards the emotion of discovery, and the imagery taps into the desire to belong. The new campaign theme taps into the desire for Steakhouse Elite to develop unique tastes that will please their customers. The company's three main product lines and 14 products provide unique and distinct flavor experiences for consumers. For those seeking a rich and dynamic taste, their Kobe-Crafted line with fat marbling meets their need to discover new flavors. For those looking for a healthy alternative, their Grass Fed product line delivers fewer calories and all natural tastes. And for those wanting the American traditional beef, the company's Angus line meets those needs. 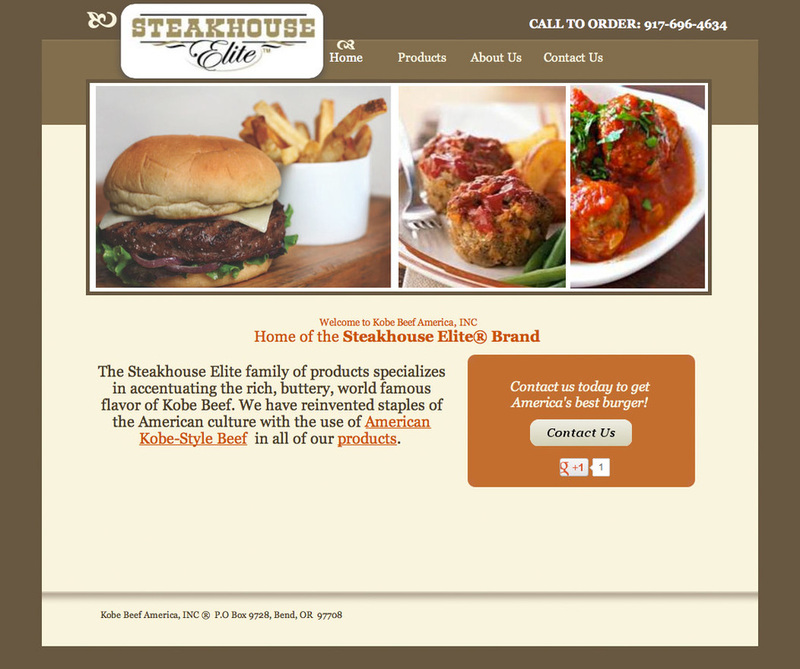 The original Steakhouse Elite website carried an old west design and focused entirely on the company's three beef products. The website was only four pages deep, did not engage web visitors and was not mobile-friendly. On top of that, the client could not make any modifications to the website themselves. Most companies make their products the hero and almost ignore the customer. The old website didn't talk to the consumer and represent their needs. It only told them about their products. ​Kinetic Branding approached the new Steakhouse Elite website design with an entire focus on the ideal customer, the consumer who had the desire to belong and discover new and amazing tastes. Kinetic purposely did not show any of their beef products on the beef company's home page. Instead, Kinetic used an image of friends sharing a meal outside, which speaks to the belonging emotion. 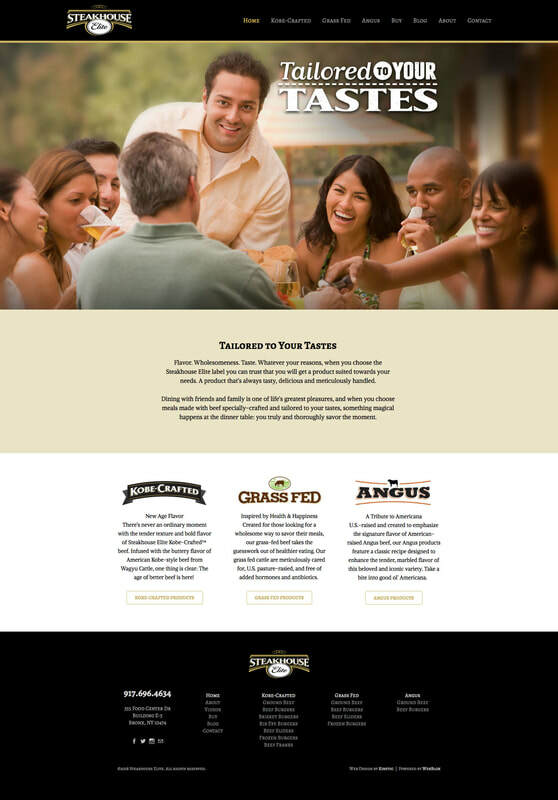 Focusing on the campaign theme: Tailored To Your Tastes, the new home page presents the idea that Steakhouse Elite has many unique flavors to discover. Once the new theme was presented, then Kinetic introduced the three product lines that would meet their need to discover new flavors that can be shared with friends and family.